Writing this on a cold, dark Midlands night, it’s a bittersweet task to cast my mind back two weeks and reminisce about a magical visit to a balmy Rome, where Chris and I attended a very special performance in the Sistine Chapel to launch their choir’s new recording of Advent and Christmas music. Using manuscripts and early editions from the Vatican Library, the repertoire includes motets by Palestrina, Josquin, Victoria and Allegri, interspersed with Gregorian chant; hearing this music in that acoustic whilst surrounded by Michelangelo’s incomparable frescoes was an experience which will stay with me for life, and I’m pleased to report that much of the atmosphere comes across just as vividly on this recording. No doubt determined at least in part by the building’s unique acoustic, everything here is sung with extreme subtlety and a delicacy which rather confounded my expectations. As a singer trained in the English choral tradition, I was struck by how little the Sistine style resembled the notion of ‘Italianate’ singing of Renaissance polyphony which I’ve heard numerous choral directors over here try to elicit in order to ginger up lacklustre early-morning attempts at Palestrina – all quasi-operatic timbre, punchy delivery and brio. Palombella (who, like all his predecessors in the role, is ordained in Holy Orders) clearly encourages his singers to eschew vocal grandstanding and approach the music in a spirit of reverence and devotion: it may take your ears a little while to adjust to the introspective quality of the music-making, but it’s well worth the effort. 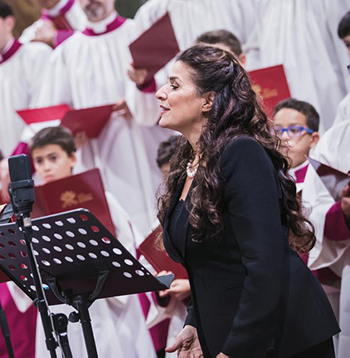 Much of the buzz surrounding this recording was generated by the presence of Cecilia Bartoli, who became the first woman to record with the choir (she strikes me as a particularly apt candidate to break this taboo, given her long history of exploring secular music which was written to circumvent the ban on female singers in Rome, and indeed throughout much of Italy, in the eighteenth century). The Roman mezzo sings on just one track (Pérotin’s hypnotic Beata viscera), but her quiet fervour seems to inspire the boy sopranos in particular to new heights; her distinctive dark, slightly febrile timbre is of course instantly recognisable, and she delivers the text with the same ardour which she brings to her operatic repertoire, but never sounds overblown or out of place. Almost every Christmas brings a new Messiah, and almost every Christmas I raise a slightly cynical eyebrow at press-releases claiming to shed new light on one of the most frequently-performed oratorios in the canon - but over the past six weeks Hervé Niquet’s vivid, almost operatic new account on Alpha has become one of my go-to recordings. He uses the 1754 version of the score, which gets relatively few outings because it calls for an additional soprano (who takes on ‘But who may abide’ and shares ‘He shall feed his flock’, both of which are assigned to the alto in the standard-issue version). Niquet makes good on his assertion that he has ‘taken [his] cue from the drama inherent in this account of the life of Christ’ from the off, with a springy, taut Overture that fairly bristles with anticipation, and the energy and impetus never slacken from thereon; ‘Darkness shall cover the face of the earth’ is urgent rather than lugubrious or brooding, and the choral cries of ‘Wonderful! Counsellor!’ in ‘For unto us a Child is Born’ ring out with a sense of awe and excitement that I’ve never heard equalled on record. Of the soloists, English tenor Rupert Charlesworth stands out for the sincerity and elegance with which he shapes ‘Comfort Ye…Ev’ry Valley’, and the contrast between the gentle-toned Katherine Watson and Sandrine Piau’s more incisive timbre strengthens the case for the presence of two sopranos. And if you’re in the market for a superbly sung collection of festive favourites old and new, look no further than O Holy Night from the Choir of Merton College Oxford, who’ve established themselves as one of the finest mixed-voice Oxbridge choirs over the past decade or so – the gently glowing, rapt account of Morten Lauridsen’s O magnum mysterium which closes the disc dispelled even my post-Rome mutterings of ‘Bah Humbug’.